Pet Retention Fund: Finances treatment for animals experiencing an unexpected but treatable illness, whose owners would otherwise surrender their pet to a shelter due to their temporary inability to afford necessary veterinary care. Rescue Fund: Subsidizes care provided to rescue and shelter animals. 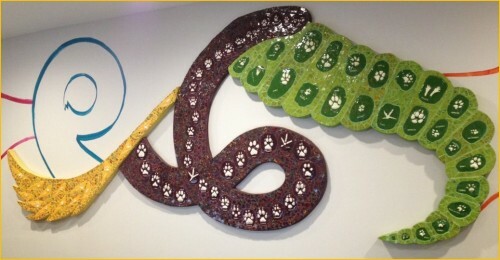 The Paws-N-Tails mural in our reception area contains paw prints from many of our patients arranged in a unique array of animal tails. All profits raised are donated to our Rescue and Pet Retention Fund. Buying a spot on our mural is a great way not only to make your pet a permanent part of Unity Animal Hospital but also to help animals in need. The mural is an ongoing project, so please contact us if you’d like to add your pet’s paw print. Our Artists for Unity Animals (A4UA) program supports local artists as well as animals in need. Participating artists agree to donate a portion of their proceeds from sales generated through Unity to our Rescue and Pet Retention Funds. We encourage you to patronize our A4UA artists. You’ll benefit from a unique work of art while supporting animals in need. Your membership goes to providing the best and most affordable pet care we can provide. Please help us extend that care to those animals who would normally go without. Every dollar counts. Thank you for your consideration.